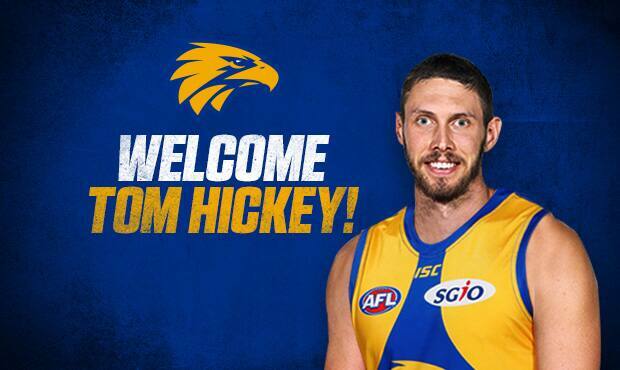 The West Coast Eagles have moved quickly to fill the void left by the departure of premiership ruckman Scott Lycett, today striking a deal that sees St Kilda big man Tom Hickey head west. Hickey, 27, is a 201cm giant who was originally drafted by Gold Coast in 2010 as a local talent priority, and was traded to the Saints in 2012. He played 12 games for the Suns and has since played 67 matches for St Kilda. “We’re delighted that we have been able to bring Tom to our club,” West Coast list manager Brady Rawlings said. “He is an athletic big man who led the ruck for St Kilda in many of his 67 games. In the deal that sees Hickey head to Perth, the club will give St Kilda selection No.39 in this year’s draft and its fourth round selection in the 2019 player ballot. In addition to Hickey, the Eagles will receive St Kilda’s selection No.60 in this year’s draft as well as their fourth round selection in 2019.